Jean-Marie Straub (b. January 8, 1933, Metz, France ) and Danièle Huillet (b. May 1, 1936, Paris, France) have made 49 films and videos since their first short film, Machorka-Muff, in 1962. Conscientiously objecting to France's role in the Algerian War, Straub and Huillet fled Paris to Germany in 1958. There they scouted locations for a film on Johann Sebastian Bach, already scripted before leaving France. But it took 10 years to find financiers who did not object to their absolute insistence on direct sound, and real musicians, as opposed to dubbed sound, playback, and actors aping the movements of musicians ("what transpires on people's faces when they do nothing more than perform a task is certainly something that is linked to the cinematograph," wrote Straub). During the 10 year period while seeking support for the Bach film they found themselves becoming filmmakers for another purpose: to ring the alarm and make lucid the gravity of Germany’s rearmament after World War II (Machorka-Muff, the satire of a military man exalted by the reinstatement of his Nazi pals, their memories and munitions, written by Heinrich Böll) and to show the brutal continuity of Germany's history – as imperialists, capitalists, fascists, social democrats – in that order and all of a piece (Not Reconciled, also from Böll). At age 33, Straub was not lionizing their new profession in exile but stating an essential fact of film and literary history when he wrote in his 3-page autobiography from 1966: "... it appeals to me to make, as a Frenchman, in Germany, films that no German could have known how to make (just as no German would have known how to make Rossellini's Germany Year Zero or Fear, no American Buñuel's The Young One or Renoir's The Southerner, and no Italian could have written The Charterhouse of Parma.)" An extreme of this unheimlich (literally "un-home-like") practice is Franz Kafka writing Amerika without ever having visited America; the Straubs made a film of Kafka's incomplete novel in 1984, and called it Class Relations. In 1968 the Bach film was finally realized. Straub dedicated a screening of it to the North Vietnamese resistance against U.S. aggression. The film is today considered a classic of cinema, when it is shown. Still exiles, they moved to Rome in the early 70s. Their work and pleasure with direct sound led to open air films throughout Italy, movies often set entirely outdoors and using preexisting texts –either Italian stories written by the exceptional post-World-War-II Italian communist authors Franco Fortini, Cesare Pavese, and Elio Vittorini – or setting German or French texts in the Italian landscape. (To say "landscape" of Huillet/Straub's films seems diminutive to the air, sky, soil, thickets, light, insects and animals one sees very clearly there.) The German of Arnold Schoenberg's biblical-modernist opera Moses and Aaron is blocked in and projected out of a middle-Italy cut-stone Abruzzo amphitheater; Bertolt Brecht's Das Kapital-ization of Julius Caesar's empire is told to a young man who comes to consciousness as he drives through the streets of then-present-day Rome; French tragedian Pierre Corneille's Othon is layered into a strange music of foreign accents, intrigues of love, state, and collapse on ancient Roman ruins while facing modern traffic and commercial buildings; we are in quiet mountains and villages of the Appennines, through precise panning shots with Fortini remembering the massacres there; to the utter south, revelations of country and family in Sicily are sung out from a Vittorini novel; on Mount Etna Friedrich Hölderlin's Empedocles, in thick German, "starts from scratch" and worships the Earth, to the outrage of town authorities; and to the north, down Tuscan slopes and in Buti forests and ravines, nine films based on Pavese (particularly Dialogues with Leuco) and Vittorini (Women of Messina) were made by Huillet and Straub together. After Huillet passed away on October 9, 2006, Straub continued their "cinema of exhilaration" where "a tracking shot can make you cry" (Thom Andersen) and made four more works based on Pavese's Dialogues with Leuco, even some using digital video. 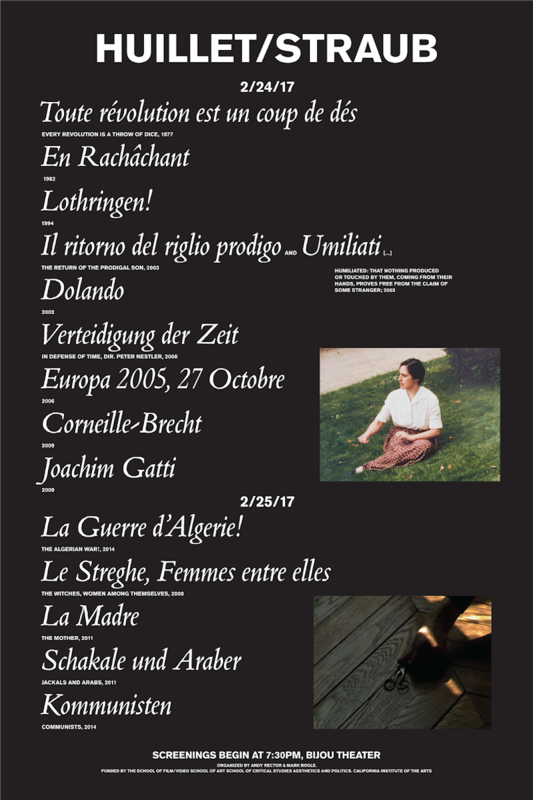 Always going further than themselves, Huillet/Straub also made films outside of this 35-year Italian base, five works of which – with French subjects, authors, and situations – we are showing in our first program: Every Revolution is a Throw of the Dice (1977), En rachâchant (1982), Lothringen! (1994), plus two cinetracts made in response to specific cases of brutality and murders by police in France, Europa 2005, 27 Octobre and Joachim Gatti. The selection of Huillet/Straub films and videos we are screening is not meant to represent all phases of their work – though in a sense any film or video of Huillet/Straub is representative of their cinematographic craft and those of their collaborators: a commitment paid equally to every project, whether a 35mm film or miniDV video, whether a "superproduction" engaging an entire orchestra, conductor, and opera company (Moses and Aaron) or a 7-minute 35mm short film based on a children's book (En rachâchant) – or a short parable from Kafka shot on gritty video with three characters in 5-square feet of a Parisian apartment standing in for an outpost in the desert (Jackals and Arabs). In their way of production, and within the movies themselves, everything is of equal importance. Huillet has even accused the modern world of separating time and space, where it was once better united, and that cinema could rediscover a little of this unity. When they say "To live means to defend a form," this has less to do with philosophy ("I would have shot Heidegger." –Straub) but is related more to the slow annihilation of peasants and farmers in an industrial society (detailed in their 1983 film Too Early, Too Late), to take just one example. "Maybe it's not even a movie," Straub wondered aloud in a post-screening talk on one of his later videos, Corneille-Brecht (2009). As a continuation of a "search for degree zero" (Luc Moullet’s phrase, from a recent appreciation) indeed this movie is "just" a woman, Cornelia Geiser, reading a text frontally to the camera in the same corner of Straub's Parisian apartment (once Huillet's mother's) that we will see several times in our program. But the words and their drama and intonation invoke massive friezes, ultimate judgments, conflagrations, the "collective hate" of Rome, “the sole object of my resentment” (Corneille), then goes down even deeper (with a Brecht radio play), down to a Hades where a trial for war crimes is taking place against an imperialist, perhaps the same imperialist, perhaps any imperialist. It would be foolish to call this minimalist, for even if the movie’s sound were turned off one could be fascinated by the changes of color in wardrobe and sunlight, here effected by jump cuts – yet another cinematographic vein Straub tapped for both sudden and gradual excitation. Fascination, magic, and belief are part of their cinema too, occurring amid its total opposite – analysis, critical faculty, and errant thought – and back again. One may feel upon leaving the theater a sharpening of the senses. Just one of many elements that makes Huillet/Straub’s films special is their use of direct sound, an undying principle of theirs, for the richness of reality it gives, for the language, accents and timbre of voice it records – for its element of chance, its explosion of the off-screen (thus the imagination of the viewer), its wild resistance to the authors' iron framework while shooting (one can’t cut wherever ones likes, but in blocks; Huillet: "Each image has a sound and you're forced to respect it."). Huillet/Straub are realist filmmakers and direct sound is a means against cinema's trickery and artifice (something the Straubs are concerned with, but in the opposite sense that the title of one academic essay on their work epitomized – "The Destruction of Narrative Pleasure"). Their films are for the world and information of every worldly or human intonation ("Dubbing is equivalent to a belief in the duality of the soul," said Jean Renoir, one of their masters). "The artist is only a receptacle of sensations, a brain, a recording machine [...]: The immensity, the torrent of the world in a tiny inch of material," Cézanne is quoted as saying in one of Huillet/Straub’s films about his work. To which Straub added: "... look at a Cézanne canvas, it doesn’t provoke sensations in you, you see there sensations materialized.” And Huillet: "You can't teach people how to think, how to use their eyes and ears – or make effective politics for that matter – they either can or can't – you can pass on a spark of something, show them a concrete operation, but not much more." "In this age that manufactures opinions like widgets and despises conviction, (Straub) is a man of conviction who says, 'I try to have no opinions.' His work, his life are animated by a passion for the real and especially for the natural world. On the occasion of the German television premiere of Eyes Do Not Want to Close at All Times or Perhaps One Day Rome Will Permit Herself To Choose in Her Turn, he wrote of the empty space, the empty ground shown at the end of each act, 'How sweet this space would be without the tragedy of cynicism, of oppression, of imperialism, of exploitation. Our earth, let us free it!' Introducing The Death of Empedocles at La Fresnoy, he said, 'if we don't want all to perish in nothingness and ruin, there is only one thing that will ever save us: a communist utopia. And not just us but the only precious thing we have, namely the ground we walk upon! Not the ground as such, but the earth and the children of the earth.' You can sense this love of the earth in almost all their films, particularly the later ones. They are the only films I know in which you can feel the force of gravity." It's to Robert Bresson that the Straubs are often likened, because of their stress on the mechanics of performance. But Bresson's people are spirits miserably imprisoned in bodies, whereas the Straubs' are proud exhibitionists, 'show people' like characters in Jean Renoir's or John Ford's pictures. And thus their words onscreen, no matter how trivial on paper, have substance, the intensity of life and its years. Suddenly movies matter. Then somehow it doesn't matter that, say, Cézanne is speaking with a woman's voice (in their films Cézanne, 1989, and Une Visite au Louvre, 2004), or that the actors in Operai, contadini (Workers, peasants, 2000) are reading from scripts in their hands. They incarnate their characters the way your mother did when reading to you in bed. We believe in these people. 'Be at one with your body,' the Straubs tell their actors. And, putting their bodies into their lines, the actors are at one with the text. Are performers in other movies ever so physical? Does anyone else burst words so bodily as does Astrid Ofner in the Straubs' Antigone (1991)?" Toute révolution est un coup de dés (Every Revolution Is a Throw of the Dice). 1977. France. Dir. Jean-Marie Straub, Danièle Huillet. With Huillet, Helmut Färber, Michel Delahaye, Georges Goldfayn, Manfred Blank, Marilù Parolini, Aksar Khaled, Andrea Spingler, Dominique Villain. 35mm. In French; English subtitles. 10 min. In 1977, Straub and Huillet invited friends to recite Stéphane Mallarmé’s 1897 poem “A Throw of the Dice Will Never Abolish Chance"—with its astonishing use of verse, syntax, division, caesura and spacing—on a hill alongside the Communards’ Wall in Père Lachaise cemetery, where some 147 men and women of the Paris Commune were executed in 1871. En rachâchant. 1982. France. Dir. Jean-Marie Straub, Danièle Huillet. Based on “Ah! Ernesto!,” by Marguerite Duras. With Olivier Straub, Nadette Thinus, Bernard Thinus, Raymond Gérard. 35mm. In French; English subtitles. 7 min. 35mm print. Beneath the subversive comedy of Marguerite Duras’ 1971 children’s book “Ah! Ernesto!,” about a determined nine-year-old boy who one fine day refuses to go to school, lies a terse and tough rejection of all forms of authority, whether patriarchal family, school, or nation. The title is untranslatable but “onomatopoeically hints at harping on, harking back, buying back, muttering, mumbling, chewing, knowing, fretting, fuming and murdering!” (Gilbert Adair). The film’s “hard-as-granite” black and white cinematography is by Henri Alekan, well known for the argentic Beauty and the Beast by Jean Cocteau. Lothringen! 1994. Germany/France. Dir. Jean-Marie Straub, Danièle Huillet. Based on Colette Baudoche, by Maurice Barrès. With Emmanuelle Straub, André Warynski, Dominique Dosdat. 35mm. In French; English subtitles. 21 min. 35mm print. In fourteen shots—mostly descriptive panoramas of a region in northeast France many times invaded or annexed by the Germans as Imperial Territory — Lothringen! tells the story of an uprooted and humiliated people. “Lothringen” is the German word for Alsace-Lorraine, France, capital Metz. 1870, 1907, 1940—mistreatment, displacement, exodus. “The German flood rose constantly and threatened to overwhelm everything.” “An ordinance has just suppressed the teaching of French in four villages.” This film is based on a novel called Colette Baudoche, Story of a Young Girl in Metz. The fragments of the novel used in the film are those related to history, of which the character Colette is the product (as is Straub, who was born in Metz and grew up under German occupation). A rich and condensed historical chronicle where fiction is an apparition of history, Lothringen! is the Straub/Huillet work that most resembles a favorite film by John Ford, "The Civil War" (1962). As in all Straub/Huillet, Lothringen! sharpens our senses and asks: how is a landscape or place marked by the passage of time or history? How can this be read? And in a film, is this not moving? Huillet: "Fiction is important for us, because when it is mixed with documentary, or a documentary situation, a contradiction is created and sparks fly. Fiction is very important, in spite of everything, to somehow ignite a fire." Straub: "I think what interests us is to show layers…"
Huillet: "Not to eradicate the traces but to build on them." Il Ritorno del figlio prodigo/Umiliati (The Return of the Prodigal Son/Humiliated). 2001–03. Italy/France/Germany. Dir. Jean-Marie Straub, Danièle Huillet. Based on Women of Messina, by Elio Vittorini. With Rosalba Curatola, Aldo Fruttuosi, Romano Guelfi. 35mm. In Italian; English subtitles. 64 min. 35mm print. “In Vittorini’s Women of Messina, a communal village is shown up as nothing but a pipe dream. The happy ending (in Huillet/Straub’s first film of this novel, Workers, Peasants, 2001) is itself a pipe dream – fabricated by the Straubs by stopping in the middle of the novel and by conflating a passing remark about foraging for laurel into a celebration of a New Eden. The true truth is humiliation, as recounted in The Return of the Prodigal Son/Humiliation, a film so linear and unrelenting and mocking (even quacking ducks) that it is difficult to believe it is a movie the Straubs “wanted” to make or a humiliation anyone would want to re-live. The truths so bitter that explode the pipe-dream of communist community are capitalist realities proclaimed by an ex-Fascist terrorist who is (the film’s hero) Ventura’s twin – a zombie ironically modelled on Carl Theodor Dreyer’s Christ-figure, Johannes Borgen (Preben Lerdorff Rye), in Ordet (1955): the land is owned, they are trespassing (as in John Steinbeck-Ford’s The Grapes of Wrath). But the truths so bitter are also market realities, Marxist realities, and these are proclaimed by three Communist partisans even more humiliatingly." Dolando. 2002. Italy/France/Germany. Dir. Jean-Marie Straub, Danièle Huillet. With Dolando Bernardini. In Italian; English subtitles. 7 min. After the production of Umiliati, Straub and Huillet gave thanks to the cast and crew in a graceful way: by inviting Dolando Bernardini to sing several stanzas from Torquato Tasso’s 16th-century epic poem Jerusalem Delivered. Europa 2005, 27 Octobre. 2006. France. Dir. Jean-Marie Straub, Danièle Huillet. In French; English subtitles. 10 min. Though this short, their first movie shot on digital video, is known as a Straub/Huillet work, it has often been screened as an unsigned, anonymous cine-tract. The “27 Octobre” of the title refers to the day three terrified young boys in Clichy-sous-Bois, outside Paris, were pursued by the police and took refuge in the off-limits area of an electric transformer station. Two of them were killed—Bouna Traore, 15, and Zyed Benna, 17—burned alive. Their deaths sparked three weeks of uprisings across France. In five camera pans Straub/Huillet document the dead-end location of this atrocity. The video was commissioned by Enrico Ghezzi of Italian television as a "sequel" to Roberto Rossellini's Europa ’51. Ten years later, in 2015, the two police officers who chased Bouna and Zyed were acquitted in criminal court of the strange charge: “Complicity in these deaths through their inaction” (see Straub’s later cine-tract Joachim Gatti ). Verteidigung der Zeit (In Defense of Time). 2007. Germany. Dir. Peter Nestler. With Jean-Marie Straub, Danièle Huillet, Ursula Illert. In German, Italian, French; English subtitles. 24 min. Made for German television not long after Huillet’s death in October 2006, this didactic introduction and portrait of the life and work of Jean-Marie Straub and Danièle Huillet was directed by their friend, the great documentarian Peter Nestler. It offers insight into some of Straub/Huillet’s essential strongholds: time, love, direct sound, reality, anti-fascism, the “tiger’s leap into the past.” It particularly examines one of Straub/Huillet’s Cesare Pavese films, From the Cloud to the Resistance (screening March 7, 2017 at Art Center Pasadena). After Huillet’s passing, many were uncertain if and how Straub would continue to make films; Nestler was certain: the work will continue. The remainder of the Straub works in this program and those that follow are beautiful evidence of that fact. Corneille-Brecht. 2009. France. Dir. Jean-Marie Straub. Based on Othon and Horace, by Pierre Corneille, and The Trial of Lucullus, by Bertolt Brecht. With Cornelia Geiser. In French, German; English subtitles. 27 min. In leaps of physical color, Cornelia Geiser recites verses from Pierre Corneille’s plays Horace and Othon, followed by extended excerpts from Bertolt Brecht’s 1939 radio play The Trial of Lucullus (later turned into an opera by Brecht and Paul Dessau in East Germany), in which a Roman General is summoned to the netherworld to stand trial for the crimes and sufferings he has inflicted on commoners and slaves. Across centuries of Western civilization, Straub and Geiser, in one corner of a small Parisian apartment, address monstrous rulers, those of ancient Rome, the kings of 17th-century France, the fascists of Europe in the 1930s and 1940s, and, by implication, those in power today. Cumulatively, it is not the rulers who are the main characters here, but the collective judgement of the oppressed on the oppressor. Joachim Gatti. 2009. France. Dir. Jean-Marie Straub. Based on Discourse on the Origin and Foundations of Inequality Among Men, by Jean-Jacques Rousseau. Narration by Jean-Marie Straub. 2 min. La Guerre d’Algérie! (The Algerian War!). 2014. Switzerland/France. Dir. Jean-Marie Straub. Based on a story by Jean Sandretto. With Christophe Clavert, Dimitri Haulet. In French; English subtitles. 2 min. As a young man Straub deserted to West Germany, refusing to fight for France against the Algerians. Later in life, he returned to this bitter historical experience with a terse noir about “the instinct to heal”…and to murder. Le Streghe, Femmes entre elles (The Witches, Women among Themselves). 2008. France/Italy. Dir. Jean-Marie Straub. Based on Dialogues with Leucò, by Cesare Pavese. With Giovanna Giuliani, Giovanna Daddi. 35mm. In Italian; English subtitles. 21 min. 35mm print. The enchantress Circe recounts to Leucò her attempts to bewitch and bed Odysseus. She talks about men and women, the human and the divine, and the brave hero who chooses to become neither pig nor God. In her adamantine repose, Circe also hints at the monotony of her own immortal fate, and contrasts it with the vibrating currents of life she so dearly craves and envies in Odysseus, with his longing for home, childhood, and love. These women-demigods are frank and sensitive at the same time, like the men of Raoul Walsh’s films, where the communities of male and female are deathly separate, and massive to each other. Walsh made a western, The Tall Men, in 1955. This 2008 Straub-film is its reverse shot. La madre (The Mother). 2011. Switzerland. Dir. Jean-Marie Straub. Based on Dialogues with Leucò, by Cesare Pavese. With Giovanna Daddi, Dario Marconcini. In Italian; English subtitles. 20 min. In a sun-dappled Tuscan corner, the boar hunter Meleager, having been murdered by his own mother to avenge the tragic accidental killing of his brother and uncle, engages in a tense and melancholic conversation about fragility, resistance, and love with Hermes, who has taken a wise female form. A villa behind knows not its function in these proceedings. This may be the most beautiful movie ever made using the Canon 5D digital camera. Schakale und Araber (Jackals and Arabs). 2011. Switzerland. Dir. Jean-Marie Straub. Based on a short story by Franz Kafka. With Barbara Ulrich, Giorgio Passerone, Jubarite Semaran. In German; English subtitles. 10 min. Franz Kafka’s parable, written in 1917, on the eve of the Balfour Declaration—an imperial letter of promise to support Zionism—is, through Straub, a ferocious picture, a hatred of hate. Not unlike Samuel Fuller's White Dog (1982), which was all but banned in the United States. This video asks for not a moment of weakness from the viewer. The players on-screen use muscles never seen in cinema before. As Brecht wrote of a demon mask: "What a strain it is to be evil." Kommunisten (Communists). 2014. Switzerland/France. Dir. Jean-Marie Straub. Based on Days of Wrath, by André Malraux. With Arnaud Dommerc, Jubarite Semaran, Gilles Pandel, Barbara Ulrich. In French, Arabic, Italian, German; English subtitles. 70 min. Organized by Joshua Siegel, Museum of Modern Art, Miguel Abreu Gallery, UCLA, Los Angeles Filmforum, Art Center College of Design, Pasadena. Information on upcoming Straub/Huillet programs hosted by Los Angeles Filmforum and Art Center College of Design, Pasadena, both in March, can be found here at Los Angeles Filmforum and here at UCLA. Special thanks to Peter Nestler, Ines Schaber, Alan Longino, Tag Gallagher, Lucas Quigley, Tom Lawson, Barbara Ulrich, James Wiltgen, Thomas Beard, Kathy Gertiz, Leighton Pierce, Amy Basen, Francisco Algarín and all those who have made the general effort of the North American and International Straub/Huillet retrospectives, books and articles, subtitles and projections, a reality. This program is an extension of the Los Angeles leg of the North American retrospective of Jean-Marie Straub and Danièle Huillet organized by Joshua Siegel, MoMA. UCLA’s portion of the retrospective this past January provided the chance to see the cinema of two filmmakers whose work has too often gone unscreened and unacknowledged. Those screenings thrilled and encouraged us to begin the work of screening the films and videos left out of the Los Angeles leg. The first program begins with films shot on 35mm by Huillet and Straub from the 70s, 80s, 90s, and early 2000s. We are happy to then present a work that has previously not been included in the North American Straub/Huillet retrospective thus far: Vertiedigung der Zeit (In Defense of Time, 2007), directed by Peter Nestler; a moving portrait of the life and work of Huillet and Straub, subtitled in English here for the first time by permission of the filmmaker. The remainder of the program consists of the work Straub made after the passing of Huillet in October 2006. The second program consists entirely of Straub's latest works shot on video, a medium prolifically taken up by the filmmaker beginning in 2009.